Oxford’s Dictionary of Finance and Banking isn’t the best birthday present for a toddler, but you can incorporate a few important finance terms at a young age. New money terms can be introduced periodically. It’s important to teach kids finance terms at an age they can understand, but don’t worry too much about which words come first. Just don’t overload them with too many at once. Find teachable moments to explain these concepts. Children learn better with hands-on experiences in science 1, which directly correlates to the social science of economics… well, to money in general really. Don’t we all learn better through real-world examples? Your child will hear about the stock market at a young age. Parents often explain that some companies have stocks you can buy, and those stocks can earn you money. Parents rarely explain how stocks are purchased. Many adults don’t even know how stocks are purchased. A simple explanation of how you set up a brokerage account, and then use that money to purchase investments, will suffice. No, your two-year-old doesn’t need a budget quite yet, but this is an important term to teach young. The concept of having a certain amount of money, and knowing where it all goes, is huge for children to grasp. When children are six and younger, it’s best to budget single amounts of money at a time. Show them that you only have $20 to spend and explain the different things you’re going to buy. Use cash to make the example concrete. Of course, the lesson always works best when the item is for the child. Pro Tip: Use comparison shopping to teach young children about budgeting. When your daughter wants to buy that specific Hello Kitty shirt, show her that Hello Kitty lives in other stores as well… cheaper stores. Let her see multiple Hello Kitty shirts at multiple stores, and then explain how buying the less expensive one will leave money in her pocket. When children start to approach college age, it’s time to sit them down and show them your budget. When your kid gets to college, he’ll need to do his own monthly budget. It’s important that he knows how to do that before he moves out. Your kid should know what a checking account is and how it differs from other types of accounts, such as brokerage and savings accounts. You can start by showing them your checking account and how debits, credits, and transfers work. Move some money around if you don’t want your child seeing your balance, but it’s key to show them how all of the different transactions create the checking account balance. You might as well show them how to balance a checkbook 2 while you’re at it. How it works for them: Investing from a young age can turn a little into a whole lot. 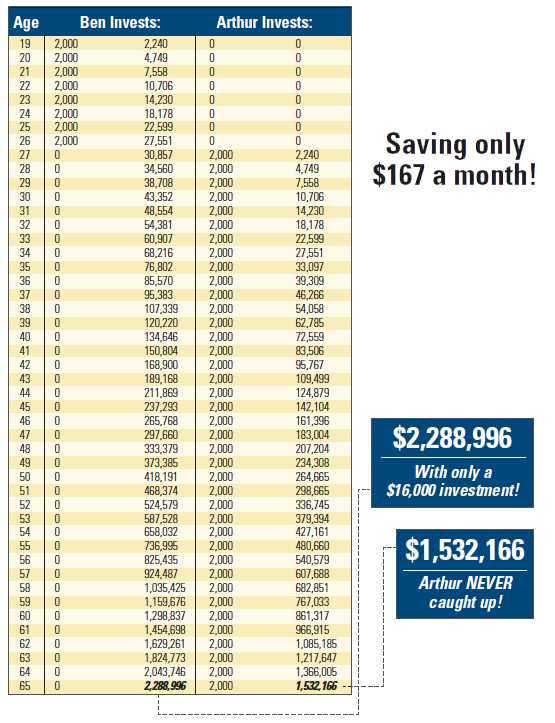 $100 invested at 10% interest (annually) means you will have $110 next year. That means $110 at 10% will turn into $121 the second year, and on and on. How it works against them: A credit card charging a 24% APR will render your minimum payment useless over time. A $150 payment on a $5,000 balance will cost you over $3,000 in interest and take almost 5 years to pay off. Around 40% of adults don’t understand the power of compound interest 3. We don’t want our kids to be one of those adults, down the road. That’s the true power of compound interest. If your kids start investing young, their money is able to do a lot more work for them than they can do for themselves. When I was 18 years old, I still didn’t fully understand the process of using a credit card. I used it like I’d never have to pay it off. It took a rude awakening and a lot of debt for me to realize how much I was overspending. According to multiple studies 5 6 7, debt causes a substantial amount of stress for people. Debt stress is increasing, but your child doesn’t have to be part of the trend. Your child must know about debt before his first credit card offer. When you go shopping, show him that there are multiple ways to pay for goods. One option is a credit card, but you need to follow through and show him the entire process of paying off the credit card bill. Show your children how debt has ruined people’s lives. It’s better that they’re afraid of it than in love with it, but the goal is to have an understanding instead of a love or fear. Children should develop a healthy fear of debt, understanding that while a mortgage may be reasonable, massive amounts of high-interest credit debt is catastrophic. Diversification is merely having a Plan A, B, C, D, E, etc., and this is something you can start explaining from an early age. Teach your kids to be prepared for anything, regardless of how good of a deal something appears to be. You can start this lesson with small toys, until they’re old enough to learn about diversity in investing. True diversity in investing means investing in stocks, bonds, cash, real estate, commodities, and endless other options. There is diversity in the diversity as well. Within stocks alone you have options for US stocks, international, tech companies, oil companies, and the list goes on. Pro Tip: Use examples of how diversification works in multiple areas of your life. Show your young children how they can diversify with their crayons. A box of eight crayons will give you a few options for coloring, but a box of 64 crayons will give you endless options, and you have more crayons if one gets broken. The key lesson here is for your child to understanding the importance of not putting all their eggs in one basket. You can even literally uses eggs and a basket to explain the concept of diversity. Dollar-cost averaging is an investment method where you invest a fixed dollar amount, on a set schedule, regardless of the fund or stock share price. This means you’ll buy more stock when the share price is lower, and less stock when the share price is higher. While this is an extremely simple concept, it’s teaching your child a bigger lesson: “playing” the stock market is a losers game. The average person cannot pick winning stocks. The average person cannot successfully “buy low and sell high,” outside of dollar-cost averaging. *Please note that the last two sentences also apply to the above-average person. You can teach dollar-cost averaging to your child by simply letting her put a certain amount of money into a savings account every month. It should be the same amount each time, and on the same day of the month. You have to also be teaching them the “why” behind doing this, since a savings account doesn’t have a share price, and it won’t gain much interest. You’re building the dollar-cost averaging habit though. I’ve heard parents say things like, “when I was a kid, you could buy a pack of gum for a quarter.” That’s a great way to start a conversation about inflation, but if you only tell your kids how cheap things were and don’t explain why, they’re going to be thinking things were cheap for no reason when you were a kid. It will be confusing for your child, and if you don’t use it as a lesson, you’re really just complaining. Your kids need to understand why things were cheaper when you were younger. They need to grasps the concept of inflation, and the fact that it isn’t going anywhere but up. They also need to understand that wages rise with inflation, so that they’re not afraid of everything costing more than they can afford. A healthy understanding, not fear, of inflation is all your kids need. Children need to understand the word “investment” in a broad sense, and in a financial sense. Show them how you can invest your money, time and effort into different things. For example, show your kids how you’re investing in yourself by reading good books (and blogs 😉 ). Once they understand the word investment, explain the financial aspect of investing. While financial investing is a complex subject, the basics are easy to grasp. At a young age, kids are able to understand the concepts of buying something that earns money over time. Low-risk, more affordable investments like certificates of deposit work well to explain what an investment is. You’re loaning money, and gaining interest in return. Once your child is old enough to understand the basic concept of the stock market, it’s time to explain mutual funds. Plain and simple, a mutual fund is a group of stocks from various companies that make up one fund. This allows you to own part of 20 to thousands of companies, depending on the fund you buy. It’s instant diversity within the stock market. I’ve read over 100 books on investing, and if I had to pull out the number one theme that was strung through all of them, it would be to invest in index funds. Mutual fund managers are living proof that almost no one is capable of picking winning stocks. Passive funds outperform active funds the majority of the time 8. This is where net worth comes in, because that’s how you know if you’re a millionaire or not. Being a millionaire doesn’t mean having a stack of 10,000 hundred-dollar bills buried under your basement, though yes that does make you a millionaire. Typically, being a millionaire means having a net worth of at least $1 million. Asset – Anything that has value and/or appreciates in value, and doesn’t depreciate. Liability – Anything that costs you money to own or depreciates in value. In short, assets make you money, liabilities lose you money. Net worth is calculated be simply subtracting your liabilities from your assets. So if you’re comfortable showing your children your own finances, you can use one simple item, such as your house, to explain how this works. Taking only your home into account, if your home appraises for $200,000, and you owe $100,000, you would have a net worth of $100,000. It’s easiest to start with one thing like this, and then explain how many different things actually play into your net worth, such as other investments, vehicles, loans, etc., for better or worse. Your children’s ultimate financial goal should be to increase their net worth. Increasing assets means increasing wealth. Any time you buy something, you’re sacrificing the ability to spend that money on something else. That’s opportunity cost. It’s the cost of what you can’t do with that money, because of what you’re doing with it. It’s easy to find real-life examples for opportunity cost. The next time your child wants to spend his own money on a pack of gum, simply explain the many things he can’t spend his money on if he chooses to spend it on the gum, including the lost ability to put it into savings. This shows kids that everything in life is a tradeoff, and it helps them make an informed decision when spending money. Just make sure they don’t get too serious about it and hoard all of their money, fearing to spend it on anything. The Rule of 72 simply tells you how many years it will take an investment to double in size, based on the size of the investment and the interest rate. As long as you have a fixed, annual return, this formula works. Savings accounts are simple and kids can grasp the concept easily. Remember that money market accounts are safe like checking accounts, but they usually provide a little more interest. However, when dealing with small amounts, it won’t make a huge difference. The main thing for you to pay attention to, as the parent, is the associated fees. Depending on your bank or credit union, you should be able to get an account that allows low balances with no fees. If not, you may want to consider putting your children’s money in your savings account and keeping track of it separately. Of course, it’s always best to take your kids to the bank so they can see the process of opening a savings account, but from a practical standpoint, sometimes it’s best to use your own savings account to avoid fees. As long as your child understands the purpose of a savings account, and that it’s not money to be pulled out all the time. When your child is old enough to understand, explain the difference between saving and investing. Explain all forms of tax to your kids. There is income tax, sales tax, specific tax on specific commodities, and certain taxes that apply to certain states. At a young age a child can understand that we pay taxes so the government can build roads, bridges, and buildings. It doesn’t have to turn into a political conversation. As long as they understand when and why we pay taxes. These 15 words are only a fraction of the finance terms your kids will need to know before they’re ready to move out. Teach these terms as soon as the opportunity presents itself, and as soon as your kids will understand them. We will have a complete dictionary, with kids finance terms, in our course. What are some other finance terms kids should know? How have you had the opportunity to teach some of these terms? Kontra, C. et al. (2015, April 24). Physical Experience Enhances Science Learning (study). UChicago. George Washington University & Standard & Poor’s. (2014). Global Financial Literacy Survey. All of the links I could find to the actual survey were broken, but this is a good summary of the findings. Dunn, Lucia & Mirzaie, Ida. (2013). Consumer Debt Stress, Changes in Household Debt, and the Great Recession. SSRN Electronic Journal. 54. Jaishu, A. (2018). A Study on Consumer Debt Stress Cause by Credit Cards. Arabian Journal of Business and Management Review. Dunn, L. & Mirzaie, I. (2012). Determinants of Consumer Debt Stress. Ohio State University. (Updated data). Spiva Statistics & Reports. Indexology.